Researchers at IESL-FORTH, Attosecond Science and Technology Laboratory, led by Dr. Paraskevas Tzallas, in collaboration with scientists at the Department of Physics, University of Crete and the Max Planck Institute for Microstructure Physics, Halle, Germany,have developed a novel quantum optical approach for describing interactions of intense electromagnet fields with atoms. This approach, published recently in Nature Communications , has led to the development of a quantum spectrometer in the extreme-ultraviolet (XUV) spectral range. The work unifies two, until recently disjoint fields, quantum optics and strong-field physics and paves the way for a new era of experimental investigations of strong-field laser matter interaction in the context of quantum optics. The description of laser-atom interactions in the strong-field regime, has been largely founded on a classical description of the laser electromagnetic field. High-order-harmonics in the extreme-ultraviolet (XUV) spectral range , generated via focusing of ultra-short infrared laser pulses (τ= 25 femtoseconds, λ= 800 nm) in noble gases, have been employed in a broad range of fascinating applications exploring dynamic processes in all states of matter. In the majority of these studies, the harmonic generation process is described by use of semi-classical theories, which do not take into account the quantum nature of the laser field, while all the experiments have been performed under highly demanding conditions as required for the characterization of radiation in the XUV spectral range. Figure 1.Influence of the harmonic generation process on the photon statistics of the driving laser. (a) Probability distribution, of the non-interacting multi-cycle coherent infrared-light. (b) High-order-harmonic generation area and recollision picture. The electron tunnels through the atomic potential at ti, accelerates in the continuum under the influence of the laser field and emits XUV radiation at the recombination time tr. (c) Probability distribution of the absorbed infrared photons following harmonic generation. (d) High-order-harmonic spectrum in the XUV spectral range. Figure from ref. . 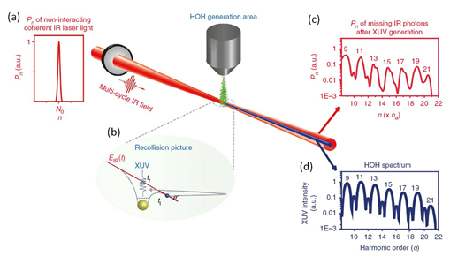 Here, using a full quantum mechanical approach for the description of the harmonic generation process, namely considering the driving laser field in a coherent state, the researchers managed to record the harmonic spectrum without the need of using any conventional XUV equipment . This was indeed achieved by performing photon statistics on the infrared light state emerging from the harmonic generation medium (Figure 1). It was found that the state of this radiation has a distinct non-classical behavior since the photon distribution consists of a series of well defined peaks, which correspond to the spectrum of high-order harmonics. The present work constitutes an experimental demonstration of the quantum optical nature of the strong-field light-atom interaction and effectively connects high-field physics and quantum optics, which up to now have appeared to be conceptually independent. Thus, studies in the direction of attosecond science and XUV spectroscopy can be performed in the context of quantum optics, while new non-classical light sources can be developed. This research has been led by Paraskevas Tzallas, Principal Researcher at IESL-FORTH and was performed at the Attosecond Science and Technology Laboratory in close collaboration with N. Tsatrafyllis (PhD candidate at the Department of Physics, University of Crete), I. Kominis (Assist. Professor, Department of Physics, University of Crete) and I. Gonoskov (Max Planck Institute for Microstructure Physics, Halle, Germany). “High-order harmonics measured by the photon statistics of the infrared driving-field exiting the atomic medium” by N. Tsatrafyllis, I. K. Kominis, I. A. Gonoskov and P. Tzallas, Nature Communications8, 15170 (2017). The XUV spectral range spans wavelengths from ~100 nm down to ~10 nm or, alternatively, represents photon energies in the range of ~10 eV up to ~125 eV.